After you assign your Rebel T6 a Wi-Fi name, follow these instructions to connect your camera to your phone or tablet for file transfer. Note that these steps relate to transferring to a device that doesn’t offer NFC connectivity. 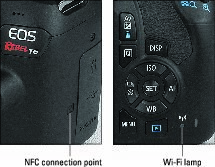 On the camera, open Setup Menu 3 and choose Wi-Fi Function, located just below the Wi-Fi/NFC option. The next screen offers two icons: one that looks like a phone and one that looks like a globe. Highlight the phone icon and press Set. Now you see the Connection Method screen, which offers two options: Easy Connection and Select a Network. Choose Easy Connection, press Set to highlight OK, and press Set again. On the resulting screen, the camera displays the nickname that you assigned your camera. You also see an encryption key, a string of characters that serve as the password to your camera’s Wi-Fi network. On your smartphone or tablet, enable Wi-Fi and then open the wireless settings screen. Your camera’s nickname should appear on the list of available Wi-Fi connections. Select the camera from the list of networks and, when prompted for a password, enter the encryption key shown on the camera monitor. On your phone or tablet, start the Canon Camera Connect app. If all the planets are in alignment, a screen should appear on your device that asks you to select the camera to finalize the connection. 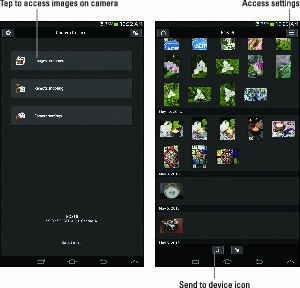 On the camera, press DISP to specify which images you want to access. You can select All Images, images from just the past few days, images assigned a particular rating, or a specific file-number range. If you choose anything but All Images, you can then set parameters for the file selection. After selecting the types of images you want to access, press the Set button as needed to exit the camera screens. On your device, choose Images on Camera. Thumbnails of your images appear, as shown on the right. To transfer an image, tap its thumbnail and then tap the send to device icon. A progress bar appears as the file is sent to the phone or tablet. Where the image files end up depends on how you have picture storage set up on your device. Look for the Camera Connect app in your device’s main settings panel to sort this out. You may need to give the app permission to access the photo-storage folder on the device. For NFC transfer, look for the camera’s NFC thing-a-ma-jingy on the left side of the camera, just forward of the door that covers the connection ports. Bring the device’s NFC antenna into contact with that mark until a message on the camera monitor says that the connection is established. Then move the two devices apart. At that point, the Camera Connect icon should launch automatically on the device. Here’s where to find the NFC connection point (left) and the Wi-Fi connection lamp (right). While a Wi-Fi connection is active, the lamp labeled on the right side lights. You can’t access any camera functions by using the camera’s own controls while the devices are connected.